Vancouver, British Columbia – A.I.S. Resources Limited (TSX: AIS, OTCQB: AISSF) (the “Company” or “AIS”) is pleased to announce a non-brokered private placement of up to 7,000,000 units (“Units“) at a price of $0.05 per unit for gross proceeds of $350,000. (the “Private Placement“). The proceeds will be used for general working capital purposes. Each Unit consists of one common share and one transferrable share purchase warrant. Each warrant will entitle the holder thereof to purchase one additional common share for a period of 12 months from the closing date of the offering at a price of $0.10 per common share provided that if the closing price of the common shares of the Company on any stock exchange or quotation system on which the common shares are then listed or quoted is equal to or greater than $0.15 for a period of fifteen (15) consecutive trading days, the Company will have the right to accelerate the expiry of the warrants to a date that is not less than ten (10) business days from the date notice is given.The Company may pay finders fees of up to 8% cash and 8% finders warrants. The Private Placement is subject to acceptance by the TSX Venture Exchange. The Private Placement securities have not been and will not be registered under the U.S. Securities Act of 1933, as amended (the “1933 Act”), or under any state securities laws, and may not be offered or sold, directly or indirectly, or delivered within the United States or to, or for the account or benefit of, U.S. persons (as defined in Regulation S under the 1933 Act) absent registration or an applicable exemption from the registration requirements. This news release does not constitute an offer to sell or a solicitation to buy such securities in the United States. A.I.S. Resources Ltd. is a TSX-V listed investment issuer, was established in 1967 and is managed by experienced, highly qualified professionals who have a long track record of success in lithium exploration, production and capital markets. Through their extensive business and scientific networks, they identify and develop projects worldwide that have strong potential for growth with the objective of providing significant returns for shareholders.The Company’s current activities are focused on the exploration and development of lithium brine projects in northern Argentina and a manganese project in Peru. On Behalf of the Board of Directors, AIS Resources Ltd.
Vancouver, British Columbia – A.I.S. Resources Limited (TSX: AIS, OTCQB: AISSF) (the “Company” or “AIS”) is pleased to announce that consistent with its strategy to acquire battery material projects, it has sourced a deposit of manganese with high concentration. 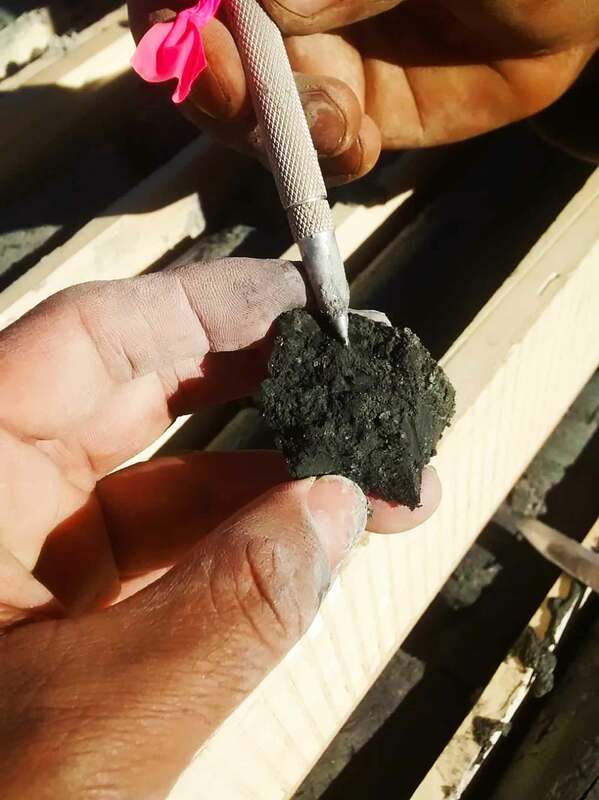 A Letter of Intent has been exchanged with the resource owner and negotiations are proceeding to secure an extraction agreement based on a royalty payment. Legal due diligence has been completed. 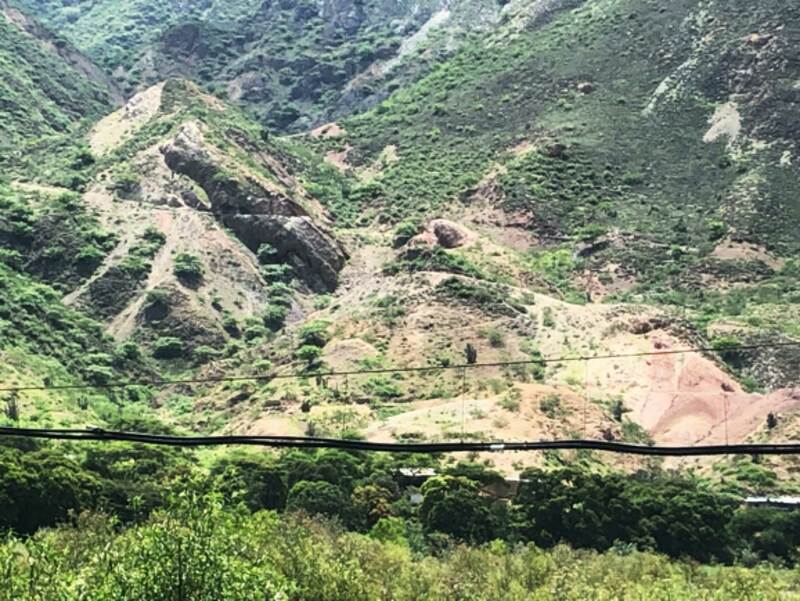 Phil Thomas, CEO and Director of Exploration visited Peru recently and was able to inspect a number of manganese properties in the south and north of Peru. This project is located approximately 300km north of Trujillo in the north, where the Salaverry Port will be used for shipping. Figure 1 – Shows footbridge over river in foreground and one of three black manganese bodies with road access at centre left. Phil Thomas CEO said that, “We are delighted to find a high grade manganese property that has excellent mine road access, good power and water supply, and sealed roads just 3km from the project. The very pro-mining community is 5km from the mine. The project currently has a mining permit for 350 tonnes per day but in the near future we will apply for permits to increase this tonnage. 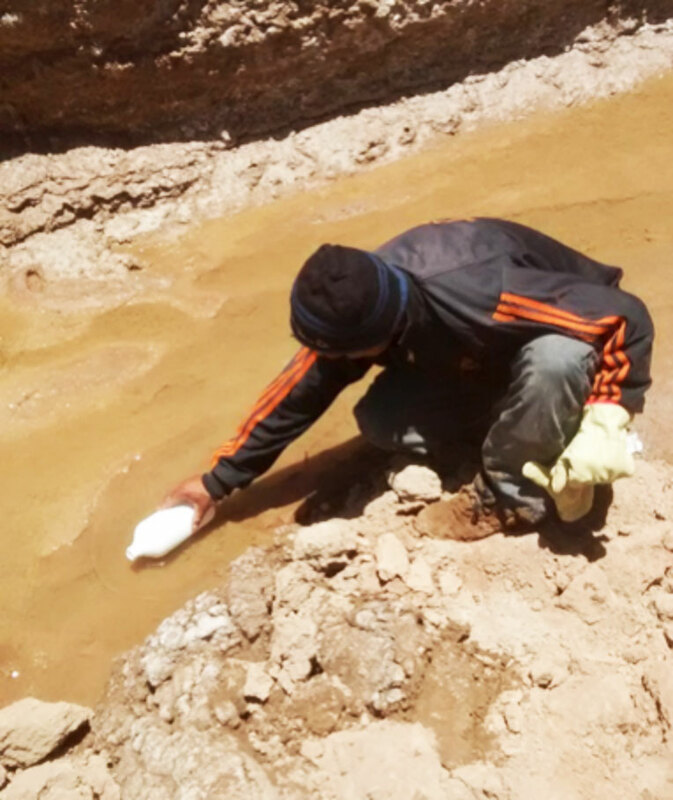 Five grab samples were taken from the three main bodies and we expect the ICP analysis to be available in the next few days from Alex Stewart in Lima, Peru”. Phillip Thomas, BSc. Geol, MBusM, MAIG, MAIMVA, (CMV), a Qualified Person as defined under NI 43-101 regulations, has reviewed the technical information that forms the basis for this news release, and has approved the disclosure herein. Mr. Thomas is not independent of the Company as he is Chief Executive Officer and a shareholder. A.I.S. Resources Ltd. is a TSX-V listed investment issuer, was established in 1967 and is managed by experienced, highly qualified professionals who have a long track record of success in lithium exploration, production and capital markets. Through their extensive business and scientific networks, they identify and develop projects worldwide that have strong potential for growth with the objective of providing significant returns for shareholders. The Company’s current activities are focused on the exploration and development of lithium brine projects in northern Argentina. Vancouver, British Columbia – A.I.S. Resources Limited (TSX: AIS, OTCQB: AISSF) (the “Company” or “AIS”) is pleased to announce that its Guayatayoc option agreement has been extended to June 15, 2019 at no additional cost to AIS. The extension was granted as a result of the UGAMP meeting being deferred until such time as the President of the Rincondillas Community signs the Assembly document which was a Department of Mining pre-requisite for the meeting. Our team in Jujuy will continue dialogue with the Rincondillas Community to respond to their queries and resolve concerns preparatory to signing the Assembly document and scheduling the UGAMP meeting. 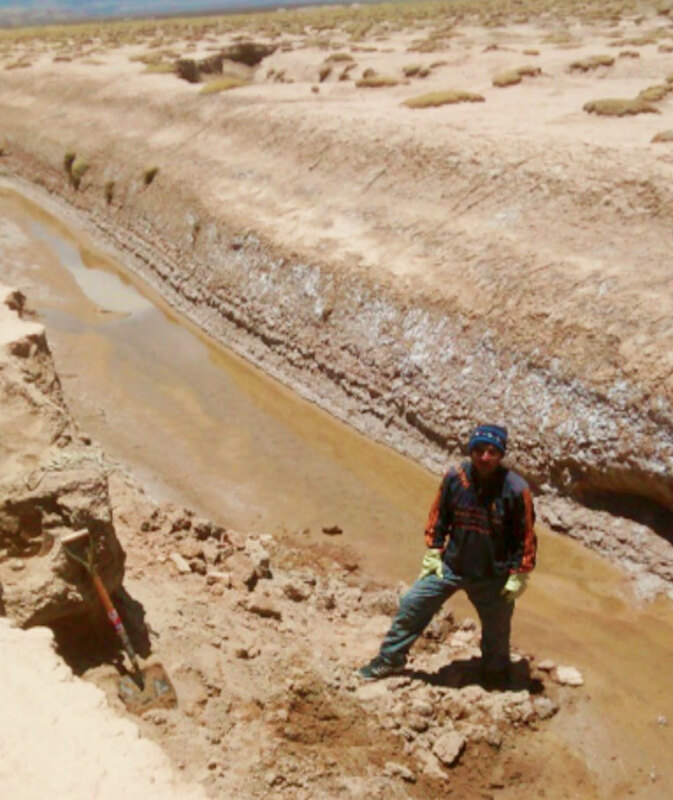 We have provided the Jujuy Department of Mining with the results of our base line environmental study that monitored air, water and soil in the locations they indicated. 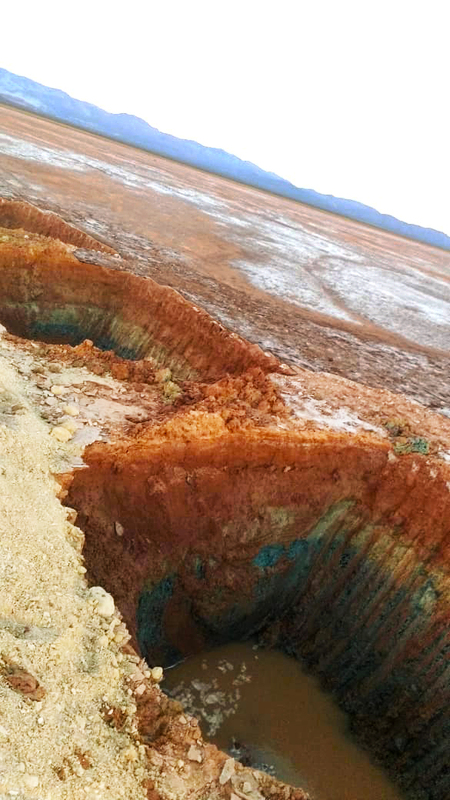 The results of the surface water testing were very encouraging with commercial grades of lithium concentrated. The table below sets out the values of the samples taken from Guayatayoc Mina. Note 1. These lithium values are above the benchmark values of being commercially viable. Note 2. The potassium lithium ratio rule of thumb is 1:15 i.e. 10,000ppm of K indicates rates of approximately 660ppm Li. Figure 1 – Sampling surface water. Figure 2 – Surface water. Phil Thomas CEO said that, “We were very appreciative of the concession that Ekeko SA has made to extend our option from March 31, 2019 to June, 15 2019. 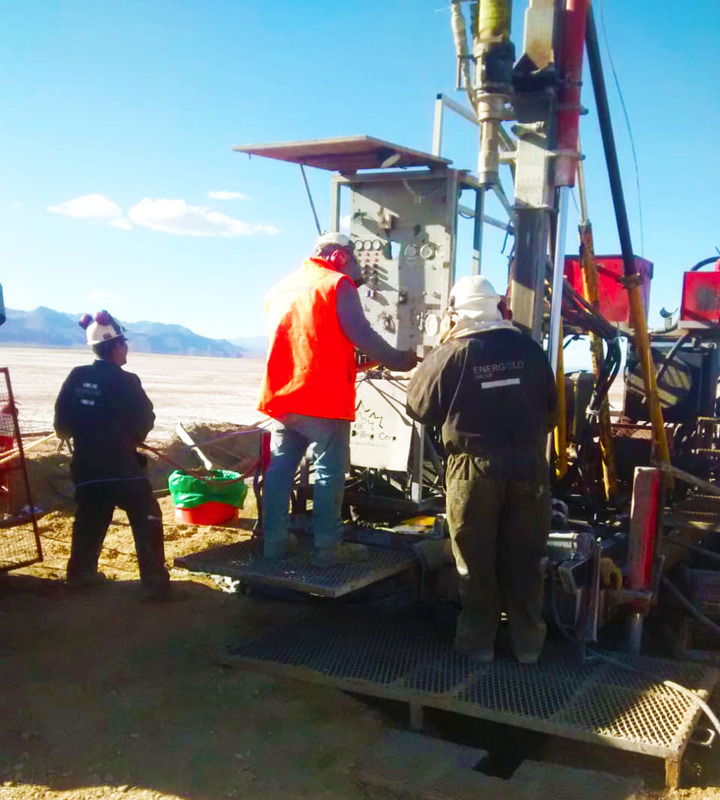 The team in Jujuy are very hopeful that all the outstanding issues can be resolved and we can move on to the next three drill holes to progress this exciting lithium brine project. We remain the only option holder with a Mining Permit in the salar”. Vancouver, British Columbia – A.I.S. Resources Limited (TSX: AIS, OTCQB: AISSF) (the “Company” or “AIS”) wishes to amend its news release dated February 26, 2019 in which it announced the closing of its $710,000 non-brokered private placement. Finders warrants have been amended from 8,000 finders warrants to 10,667 finders warrants. Vancouver, British Columbia – A.I.S. Resources Limited (TSX: AIS, OTCQB: AISSF) (the “Company” or “AIS”) is pleased to announce that it has completed the sale of 12,622,222 units (“Units”) at $0.05625 per unit for gross proceeds of $710,000, (the “Private Placement”). The proceeds will be used for exploration on the Guayatayoc property and for general working capital purposes. Each unit consists of one common share and one transferrable share purchase warrant. Each warrant will entitle the holder thereof to purchase one additional common share for a period of 12 months from the closing date of the offering at a price of $0.12 per common share provided that if the closing price of the common shares of the Company on any stock exchange or quotation system on which the common shares are then listed or quoted is equal to or greater than $0.20 for a period of fifteen (15) consecutive trading days, the Company will have the right to accelerate the expiry of the warrants to a date that is not less than ten (10) business days from the date notice is given. The Company will pay finders fees totaling $600 and issue 8,000 finders warrants. The Common Shares issued pursuant to the Private Placement and the exercise of the Warrants will be subject to a hold period of four months and one day from the closing date of the Private Placement, in accordance with applicable Canadian securities laws. Closing is subject to final acceptance by the TSX Venture Exchange. Vancouver, British Columbia – A.I.S. 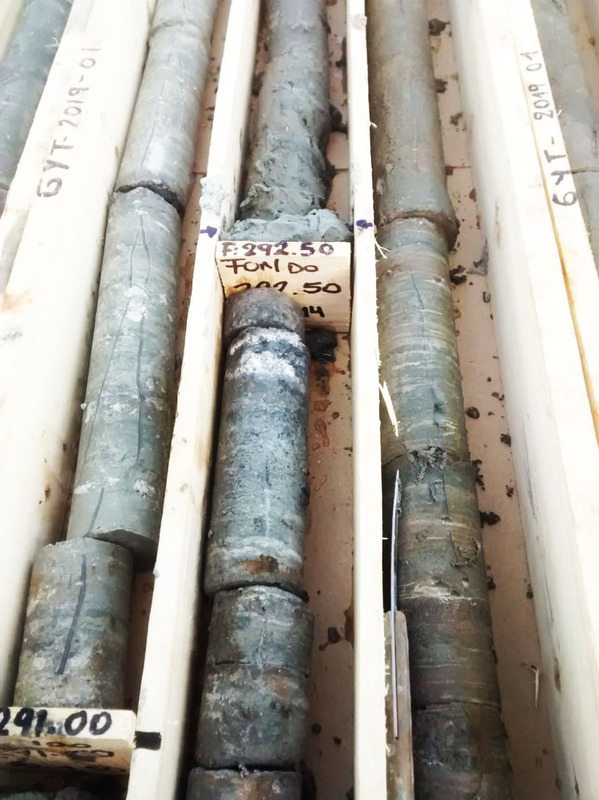 Resources Limited (TSX: AIS, OTCQB: AISSF) (the “Company” or “AIS”) is pleased to announce that the lithium brine samples taken from Drill Hole 1 (DH1) at the Company’s Guayatayoc Mina lithium project have been analysed by SGS, an international accredited chemistry analysis firm in Salta. The results are excellent given this hole had to be moved 150 metres east of the target zone to the Quebralenas area where we have drilling rights. We expect to receive our drilling permit for the target zone which is in the Rincondillas area within 30 days of the 28thFebruary 2019 UGAMP meeting. Mg:Li ratio is below 8 with an average of 7.1, which means we will have a lower cost of production, in the event we reach the production stage, as we will only need 7 parts of calcium hydroxide to remove the magnesium. Lithium range is 95-106ppm. Our minimum commercial value is 187ppm in our production model. Pit G6 sampled 270ppm Li which was previously reported. Potassium and boron are both low thus the sodium sulphate input for the potassium removal and the ion exchange system to remove the boron will not be of any significance. Figure 1 – The star shows the location of DH1. G1- G36 show where we have trenched and sampled and the solid yellow lines are the VES geophysics traverses. The black lines show the community boundaries. 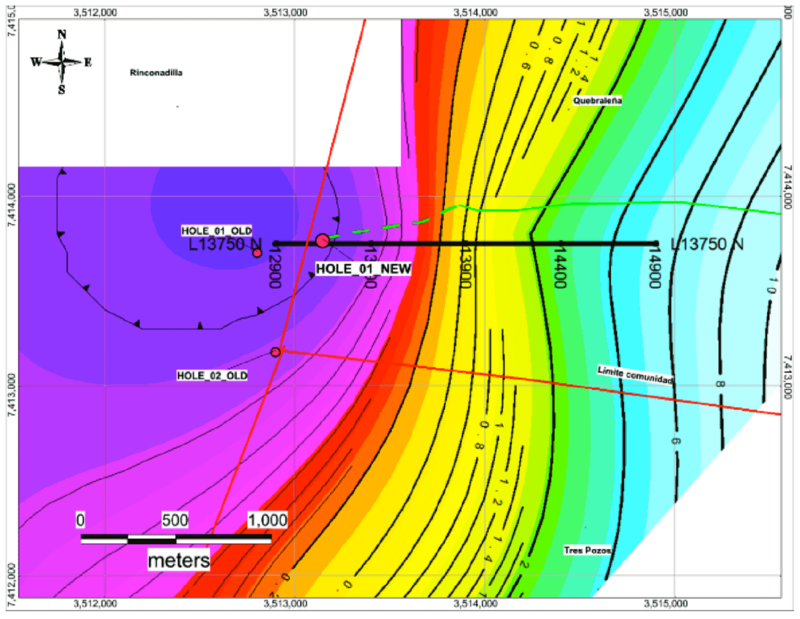 Figure 2 – Is the geophysics at 100m depth. The DH1 location was moved another 50 metres to the east away from the target zone, to the 0.025 Ohm-m zone. The community boundaries are marked in red. The geophysics traverse line is in black. Figure 3 – Shows traverse 11750 or line 1 in Rincondillas area and the target zone (dark purple area) which is 150m in depth and 7 kilometres wide with a length of 5 kilometres. The target zone has a resisitivity of 0.015ohm-m, lower than salt water which is 0.025 Ohm-m.
Vancouver, British Columbia – A.I.S. Resources Limited (TSX: AIS, OTCQB: AISSF) (the “Company” or “AIS”) is pleased to announce that drill hole one on Guayatayoc Mina was completed 6 February 2019. A brine sample will be taken at the 400 metre level today and downhole geophysics undertaken over the weekend to determine porosity and permeability. 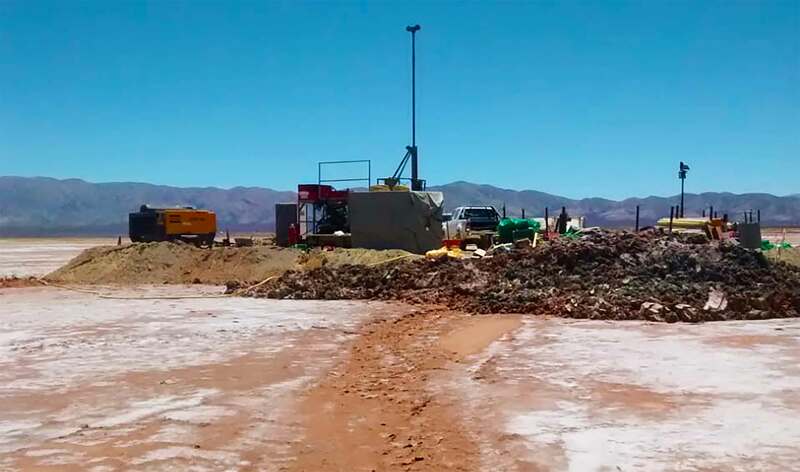 Brine sampling commenced at the Guayatayoc Mina lithium project in Northern Argentina on January 29, 2019 at 295 metres with further samples taken at the 350 metre and 400 metre intervals. SGS, an international accredited chemistry analysis firm in Salta advise that preliminary results will be available in the next three to four days and full analysis results late next week. Phil Thomas CEO said, “Drilling was very fast and we intersected a sand unit near the bottom of the hole which didn’t have as much brine as the clay halite units above it. The sand unit was possibly an ancient river area where clean sand had settled but was not compacted. Dr Romina Steinmetz who completed her PhD at Guayatayoc visited the drill site and inspected the core. This analysis was consistent with the geophysics so there was no advantage to drill deeper. We are looking forward to the results from SGS and downhole geophysics as it will have a lot of information we can use when we drill in Rincondillas area in Guayatayoc III. It is great that we got the Rincondillas UGAMP meeting scheduled for 28 February 2019 allowing us to progress this exciting lithium project”. Vancouver, British Columbia – A.I.S. Resources Limited (TSX: AIS, OTCQB: AISSF) (the “Company” or “AIS”) is pleased to announce that brine sampling commenced at the Guayatayoc Mina in Northern Argentina on January 29, 2019 at 295 metres depth. The target depth is 400 metres. Brine samples will be sent to SGS in Buenos Aires for testing and to Geoanalytics in Tucson to measure porosity and brine release characteristics. SGS will take about 10-14 days to process the samples after they receive them. The next packer test for brines will be at 325 metres where the maximum resistivity contrast occurred. 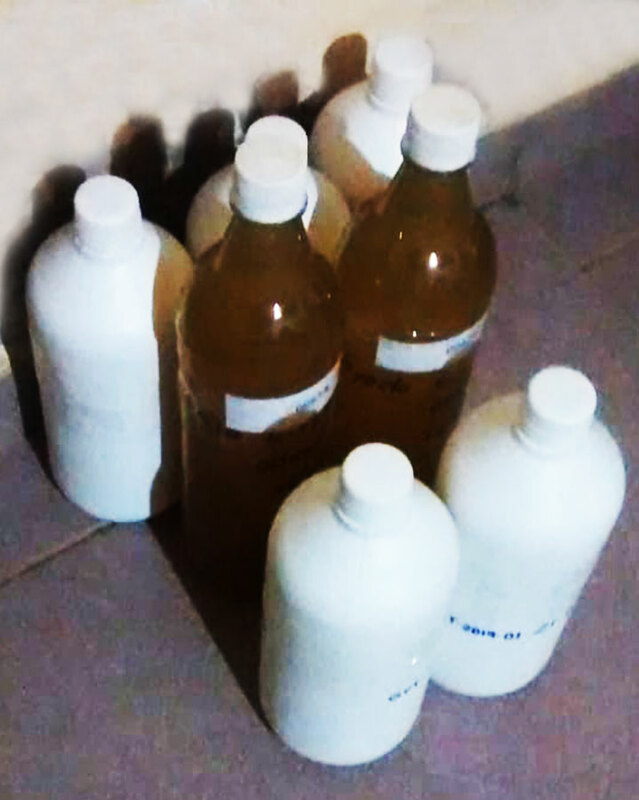 Figure 2 – Brine sample bottles duplicated. 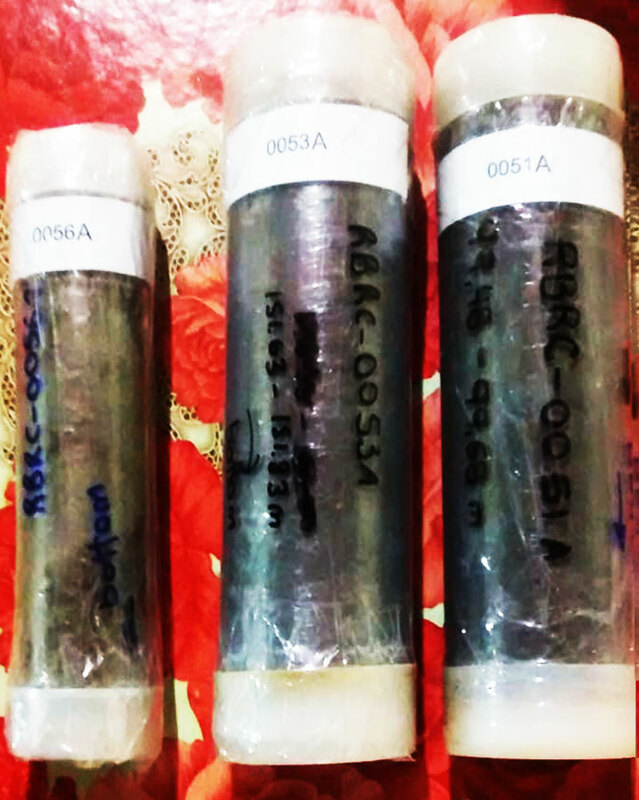 Figure 3 – Core sample sealed and prepared for analysis at Geoanalytics, Tucson USA. Figure 4 – Drill core showing halite (salt) sequences at 292m depth. A.I.S. 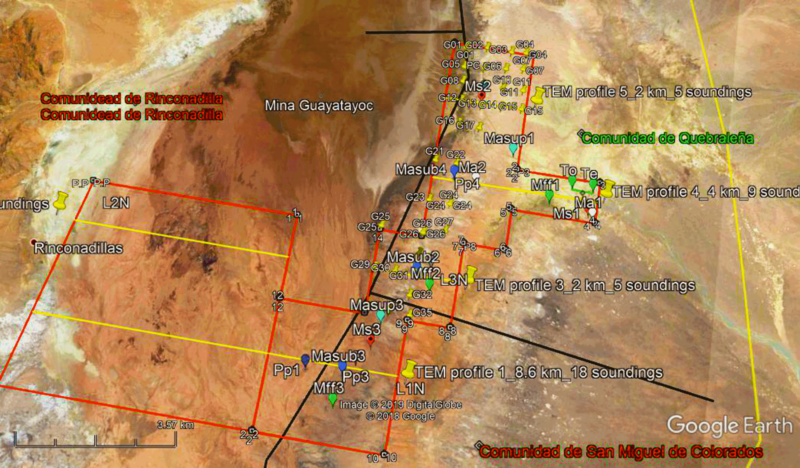 Resources Commenced Drill Hole One at Guayatayoc Mina, Argentina on January 20, 2019. Guayatayoc Mina III Assembly Document Signed by Rincondillas Community – Planned Date for UGAMP, February 24, 2019. Vancouver, British Columbia – A.I.S. Resources Limited (TSX: AIS, OTCQB: AISSF) (the “Company” or “AIS”) is pleased to announce that drilling commenced at the Guayatayoc Minacateo in Northern Argentina on January 20, 2019. The target depth is 400 metres. 143 metres has been drilled so far. Brine samples from the packer test at 102 metres depth will be sent to the laboratory this week for detailed analysis. We expect lithium values to increase as we approach 250-300 metres depth. The next packer test for brines will be at 250 metres. 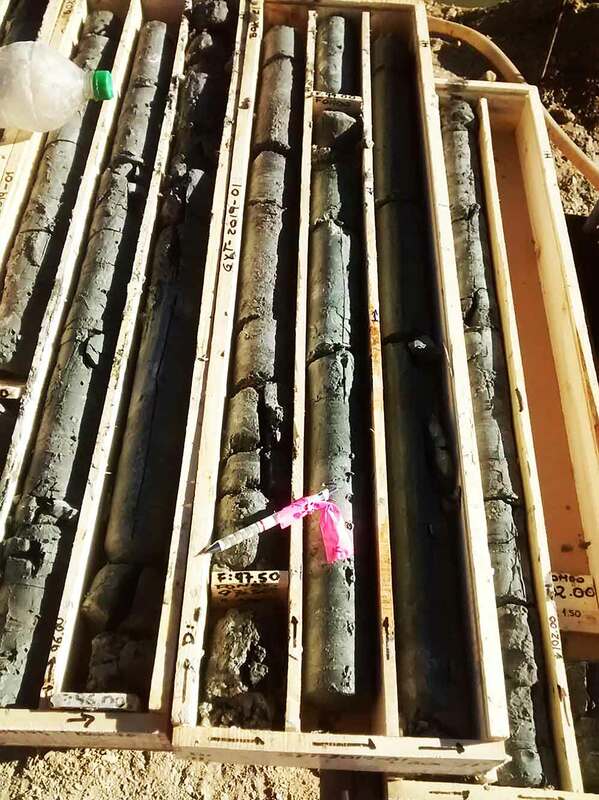 The drill core (Fig 2) is composed of black and green clays down to 102 metres. We are seeing more sand in the clay and the presence of salt flakes, which is a good sign for porosity. Figure 2 – Drill Core. 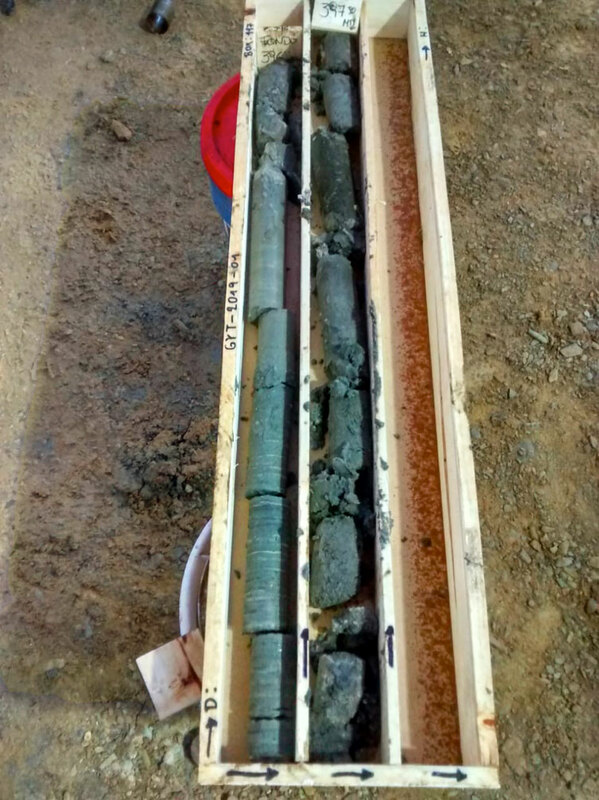 Picture above shows the drill core at 94.5m depth displaying gray clay sediment with sand and salt crystals. The picture below (Fig 3) shows the black clays with sand and salt crystals in it. Figure 3 – Black Clays. Phil Thomas CEO said that, “The drilling guys have really put in and got us going three days earlier than expected. We haven’t seen any significant evidence of brine pressure so far so we didn’t have to stop to cement the hole. Core coming out has been very encouraging. It seems to have the predicted porosity, resistivity and Ph we want to see. The packer brine sampling test results will tell us if we are in the right location. We are delighted that the Rincondillas community signed the Assembly Document and a meeting with the Department of Mines was concluded to provide some additional technical information and set a date for the UGAMP meeting on 24 February 2019. Phil Thomas will attend this meeting. A.I.S. Resources Ltd. is a TSX-V listed investment issuer, was established in 1967 and is managed by experienced, highly qualified professionals who have a long track record of success in lithium exploration, production and capital markets. Through their extensive business and scientific networks, they identify and develop projects worldwide that have strong potential for growth with the objective of providing significant returns for shareholders.The Company’s current activities are focused on the exploration and development of lithium brine projects in northern Argentina. http://aisresources.com/wp-content/uploads/2016/11/AIS-Logo-1-loading-icon-300x225.png 0 0 AIS-H http://aisresources.com/wp-content/uploads/2016/11/AIS-Logo-1-loading-icon-300x225.png AIS-H2019-01-25 05:30:342019-02-07 01:06:28A.I.S. 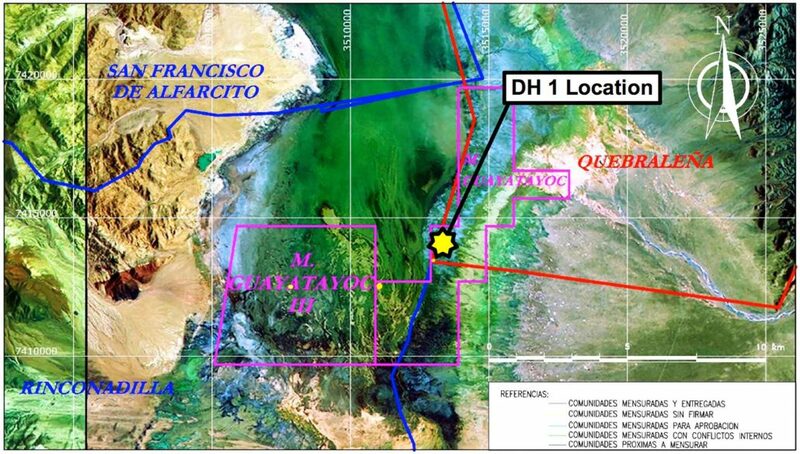 Resources Commenced Drill Hole One at Guayatayoc Mina, Argentina on January 20, 2019. Guayatayoc Mina III Assembly Document Signed by Rincondillas Community – Planned Date for UGAMP, February 24, 2019. Vancouver, British Columbia – A.I.S. Resources Limited (TSX: AIS, OTCQB: AISSF) (the “Company” or “AIS”) is pleased to announce that the 3km road to drill hole DH1 and the drill pad have been completed. 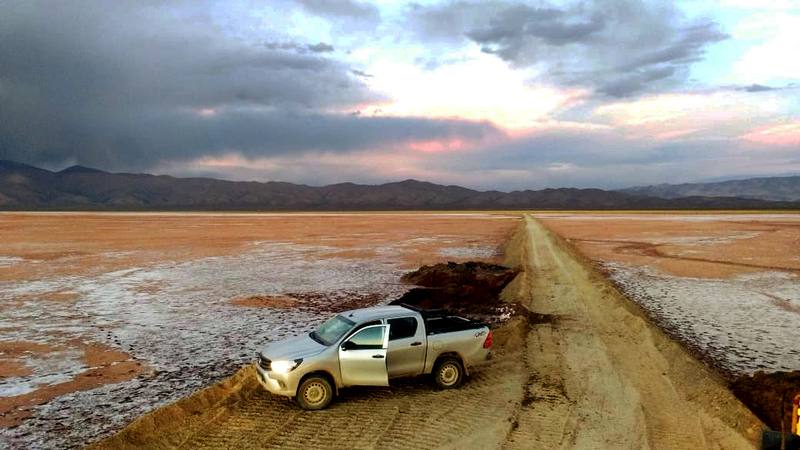 The Salar contains brine less than 0.6m below the surface so an 0.8melevated road was constructed to support heavy trucks and machinery. The elevated road held up well with only slight rains in our area although rains were heavy elsewhere in the region. The rig, drill rods and supplies arelocated only three kilometres away.Drillers haveprovided their approvalof the road and have commenced preparations to begin drilling shortly. 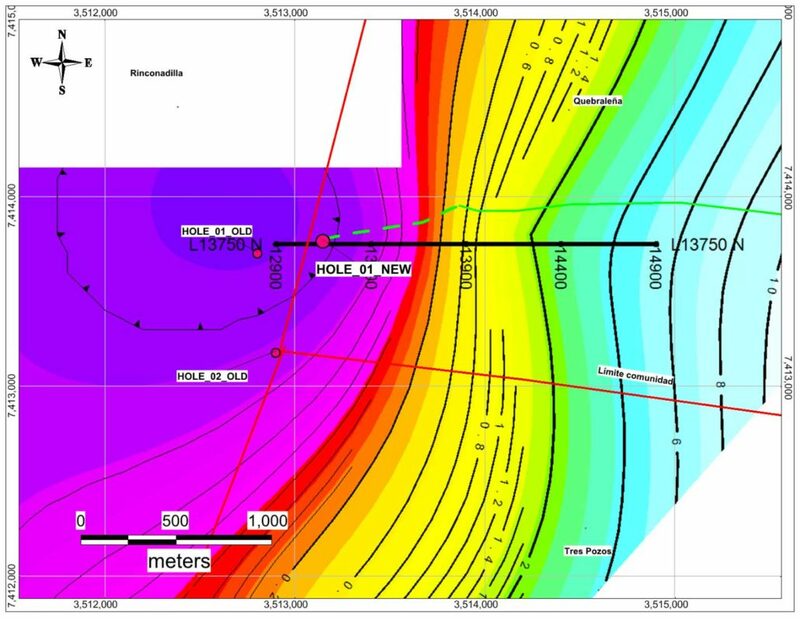 This is the composite plan at 300m depth of resistivity. The dark and light purple areas are below 0.025 ohm-m value which indicates potentially other elements beside sodium chloride is reducing the resistivity. The red lines are the border between Quebralena community and Rincondillas community. The black line is the VES geophysics traverse line. The original location was found to be on Rincondillas land which is pending a drilling permit so it was moved 100m to Quebralena land which has a drilling permit in place. Significant progress has been made with the Ricondillas community and we believe they are very close to signing an assembly document allowing us to progress to a UGAMP meeting. Our traditional owners liaison team is meeting with the community on January 20, 2019.